ROCKWOOL is made of rock, generally a combination of basalt, limestone, and coal, are heated to 1200 degrees Celsius so that they melt into lava, in this melting state, they are centrifuged to form fibers. 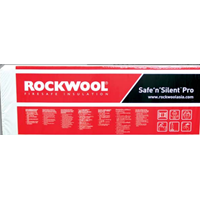 Rockwool Safe'n'Silent 100 Pro 380Recommended applicationsROCKWOOL Safe‘n’Silent 100 Pro 380 is designed and manufactured to achieve excellent acoustic insulation performance in all types of drywall partition configurations. 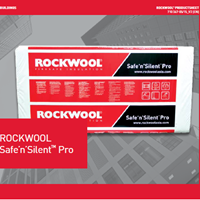 It is recommended to be used for drywall partition applications in hospitals, cinemas, schools, offices, residential and industrial buildings.Safe’n’Silent Pro meets the requirements of Noise Criteria (NC) specifications developed by the ROCKWOOL company. NC comprehensively measures the noise levels of a room and with the use of NC ratings, recommends the desired acoustic comfort level of a room/space.FacingsOptional facing with one or two sided glass tissue is available upon request for perforated wall panel. For more information, please contact your local representatives.Packaging and storageROCKWOOL Safe‘n’Silent 100 Pro 380 is shrink-wrapped in polyethylene sheets for ease of handling, transportation, storage and identification. Products should be stored indoors or under waterproof covering.Density and ThicknessROCKOOWL Safe'n'Silent is available in Density 40kg/m3, 60kg/m3, 80kg/m3 and 100kg/m3, with 25mm and 50mm thickness. ROCKWOOL Cool’n’Comfort Series is designed for single or double skin metal roof, with or without skylight, to satisfy U-value requirements in order to achieve the desired roof thermal transmittance value (RTTV). It is also available with a radiant barrier facing to suit the requirements of all types of roofs in commercial and industrial buildings. Cool’n’Comfort is highly effective in reducing solar heat gain through the roof for non air-conditioned buildings; and where air-conditions are used, Cool’n’Comfort helps to save energy and reduce energy costs. The unique properties of Cool’n’Comfort contribute to making an energy efficient, environmentally sustainable and fire safe roofing system, thereby creating a cool, comfortable and safe indoor environment.The double skin roofing system is a high performance roofing system comprising of an aesthetically designed trapezoidal or standing seam profile metal sheet on the top and a metal trapezoidal tray at the bottom. The two metal sheets are fixed together with a z-purlin creating a gap in the roof space for installation of insulation and vapor barrier. When coupled with Cool’n’Comfort SL Series stone wool insulation, it boost the performance of the double skin metal roofing system with improved level of thermal insulation, acoustic and fire protection.Cool’n’Comfort SL, a semi rigid slab product, is a versatile insulation that is available in various sizes to provide ease of installation and a perfect fit between purlins. Rockwool Safe'n'Silent density 60 thick 50mm 600x1200mm is perfect for sound absorbers in karaoke rooms and rooms that require good acoustic performance. 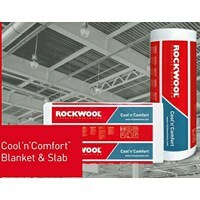 We only sell original Rockwool with brand ROCKWOOL, available type Slab and Blanket, Thermalrock and Safe n Silent, density 40,60,80,100, 25mm and 50mm thickness. 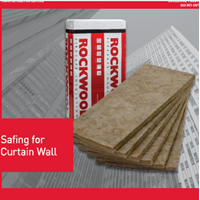 Rockwool Safing For Curtain WallRock safe products are lightweight and easy to handle. Galvanized steel Z brakets are inserted into mid thickness of the slab, at every 500 mm length, at the centre of the slab. 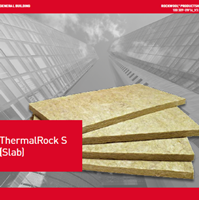 Rockwool ThermalRock Slab (S)Common applicationsThermalRock S is manufactured in a wide variety of thicknesses and densities to suit most requirements, suitable for general application in residential, commercial and industrial buildings.FacingsThermalRock S products are available in plain, aluminium foil facings and one-sided or two-sided glass tissue facings.Packaging and storageThermalRock S is shrink-wrapped in polyethylene sheets for ease of handling, transportation, storage and identification. Products should be stored indoors or under a waterproof covering. Rockwool ConRock for Sandwich PanelsROCKWOOL stone wool products are non-combustible with a melting point more than 1000°C. They are particularly suitable for thermal insulation, fire protection and sound reduction/absorption.ROCKWOOL stone wool is inorganic and contains no nutritious substance. Therefore it will not be attacked by microorganisms. Stone wool will not rot and does not attractvermin.DimensionsROCKWOOL ConRock is supplied in L-Series and S-Series. The L-Series are supplied as pre-cut lamella, whereas S-Series are supplied as slabs for customers having their own lamella cutting facilities.Handling and InstallationROCKWOOL ConRock products are lightweight and easy to handle. To cut the product, it only requires a sharp knife with serrated edge. 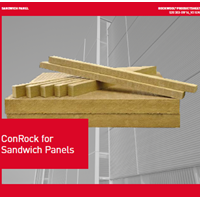 To install, ConRock should be placed in staggering position in accordance with the sandwich panel manufacturer’s requirement.Packaging and StorageROCKWOOL ConRock products are packed in shrink films as bales or packed in pallets as appropriate or as requested by the sandwich panel manufacturer. Corner protectors are available upon request.